In an unprecedented move, the new Pope Francis has stated that Catholics should show compassion toward their fellow man, even if that man is homosexual, divorced, or, even a woman. In an interview with an Italian Jesuit journal, La Civilta Cattolica, the Pope was asked how Catholics should behave towards those who are divorced or remarried or gay. 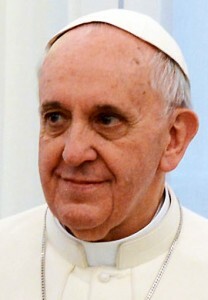 For some reason, this attitude of support and love towards one’s fellow man, which I understand to be taught extensively in the New Testament, and which does in fact constitute one of the fundamental tenets of Christianity, has caused some surprise among a mainstream press who are used to the Pope’s predecessors’ approach of condemnation towards those who do not follow selected passages of Leviticus to the letter. However, this is exactly the kind of reform the Catholic church is going to need to make if it wishes to remain relevant into the Twenty-First Century. In the light of dwindling church attendance and increasingly vocal exasperation and scepticism towards religion in general from mainstream society, Pope Francis, whose real name is Jorge Mario Bergoglio, was elected in March. He is an Argentinian of Italian descent who, he says, has ‘never been a right-winger.’ It was hoped upon his election that he would bring the Church more in line with societal values and it looks that he is following through with this mandate to a certain extent. His views are certainly more palatable to a liberal society than those of his immediate predecessor, the conservative Benedict XVI, who was dogged by Hitler Youth connections and allegations of child abuse cover-ups. According to the 2011 Census, 25.3% of Australians identify as Catholic; however, the Catholic Schools Association 2011 survey found that only 12.5% of Catholics, or 0.03% of the Australian population, attend Mass every Sunday – a figure which it notes has been dwindling since the 1950s. This entry was posted in Featured, News and tagged marriage, Pope Francis, women. Bookmark the permalink.